As Julia Child once said, “You don’t have to cook fancy or complicated masterpieces, just good food from fresh ingredients.” I couldn’t have said it better myself! I love the simplicity of recipes like this. It highlights bright, fresh, seasonal ingredients—like asparagus, basil, and tomatoes—that you can find at your local farmers market. If you’re looking for a new spin on a side dish or want to change up your potluck routine, give this perfect-for-summer recipe a try! 1. Combine 1 cup quinoa with 2 cups water in a medium pot, and bring to a boil. Reduce heat to low and cover. Cook for 12 to 15 minutes or until almost all of the water is absorbed. DO NOT STIR QUINOA. Remove quinoa from heat and leave covered for 5 minutes to steam. Remove lid and fluff with fork. Set aside. 2. Add olive oil to large skillet over medium heat. Sauté onions for about 5 to 6 minutes or until they begin to soften. Add tomatoes and cook for 6 to 8 minutes. Add asparagus and ¼ cup water. Toss with tongs, and cook for 5 to 6 minutes or until asparagus is crisp-tender but still bright green. Remove from heat. 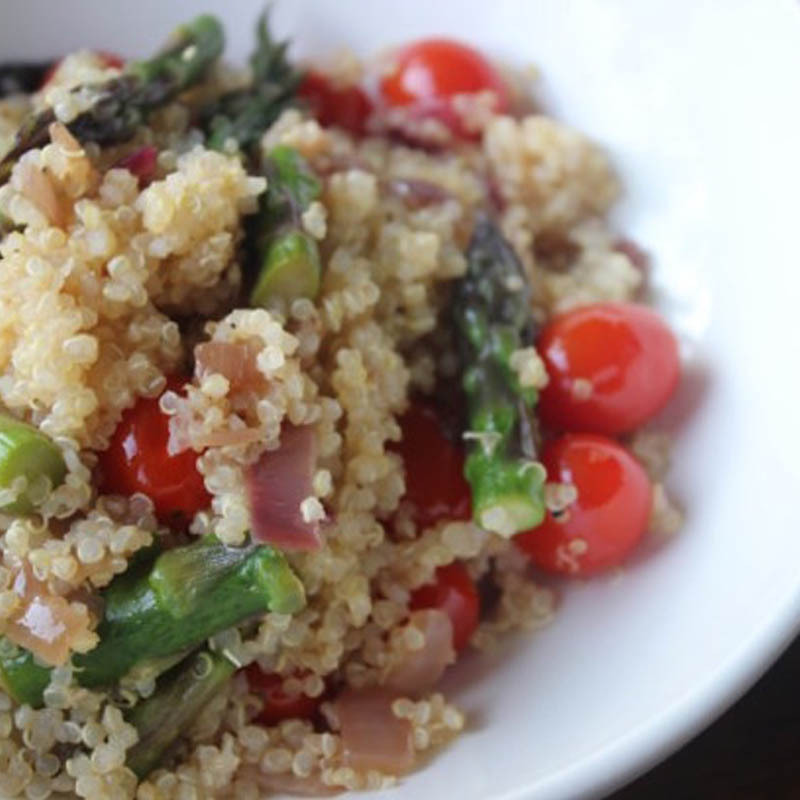 Add vegetables to quinoa and toss to combine. 3. Whisk lemon juice, zest, garlic, salt, and pepper together. Add olive oil and continue whisking until evenly combined. Pour dressing over salad, sprinkle basil on top, and toss everything to combine. Serve warm or chilled.